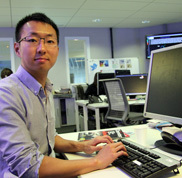 Yi Song, Paris-based Chinese journalist at FRANCE 24, covers world-wide news on a daily basis. But his FRANCE 24 blog is dedicated to China, the world’s second largest economy. What are the most exciting stories behind its success? How does China play its role in Africa, Europe and Middle-East? Why is there a mixture of love and fear towards the Middle Kingdom? Here you could have a glimpse of what the real China looks like. Friday’s foiled Thalys train assault, should it be eventually defined as a terrorist act, may be seen as a new chapter in the fight against terrorism. True life is elsewhere, as the Czech novelist Milan Kundera says. While everyone is looking for his final destination, for the wealthy Chinese, there is one common direction - Out of China. Sometimes it seems difficult to understand certain stories taking place in China. The latest is a jailbreak case in Heibei province in north China which turned out to get a sweeping admiration from Chinese netizens. Why readiness to help becomes a risk in China? Why Chinese people are reluctant to help? Is it really that they have lost their faith and social conscience during the economic boom? Why is it so hard to do good in China? Billet: How did a jailbreak case gain admiration on the Net? Billet: Why readiness to help becomes a risk in China?